Obesity is a complex, chronic disease which occurs due to excessive depositions of adipose tissue in the person’ s body. In overweight, adipose tissue is usually deposited in the area of hips, stomach, breast and around internal organs. There are a lot of causes of obesity in children and adults. One of the main causes is overeating or eating disorder. Due to daily overeating, food coming into the body is processed and stored as fatty deposits. The reason of using excessive amounts of food can be severe psychological experiences or metabolic disorder in the body. lack of regular exercise (hypodynamia). 4 degree of obesity (excess of fatty tissue in the body is more than 100%). Patients with 1 and 2 degrees of obesity usually do not complain of the deterioration of general health status, or some individual symptoms. In obesity of 1 and 2 degrees patients seldom complain of the increased fatigue and overall weakness. 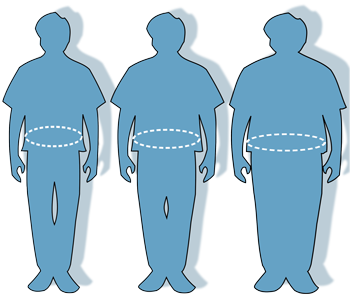 Obesity of 3 and 4 degrees is characterized by more severe symptoms. In patients with 3 and 4 degrees of obesity are observed: resistant heart pains, breathlessness during low physical activity, hypertension, decreased working capacity, drowsiness, headache, depressive state, inferiority complex (in some cases). Obesity of 3 and 4 degrees is usually accompanied by the development of chronic diseases: biliary tract and liver, musculoskeletal system, cardiovascular system. Often in patients with obesity of 3 and 4 degrees is diagnosed hyperlipidemia and type 2 diabetes. Balanced and well-chosen diet is half the battle in obesity treatment of different etiology. In obesity, recommended diet is to limit the daily ration of the consumed food. Herewith, one should monitor that vitamins, minerals, proteins and unsaturated fatty acids come in sufficient amount in the body. When obesity, consumed food should be low-calorie and should include products with a low energy content. It is not recommended to consume fried and steamed dishes with a high content of salt during obesity. Regardless of obesity severity, a patient is recommended to limit the use of: cereals, sugar, potatoes, bakery products, confectionery products. When obesity, it is recommended to consume exceptionally rye or bran bread in limited amount (not more than 300 grams a day). It is recommended to eat more vegetable and fruit salads in 3 and 4 obesity degrees. It is strongly not recommended to consume food rich in cholesterol for patients with 3 and 4 obesity degrees.